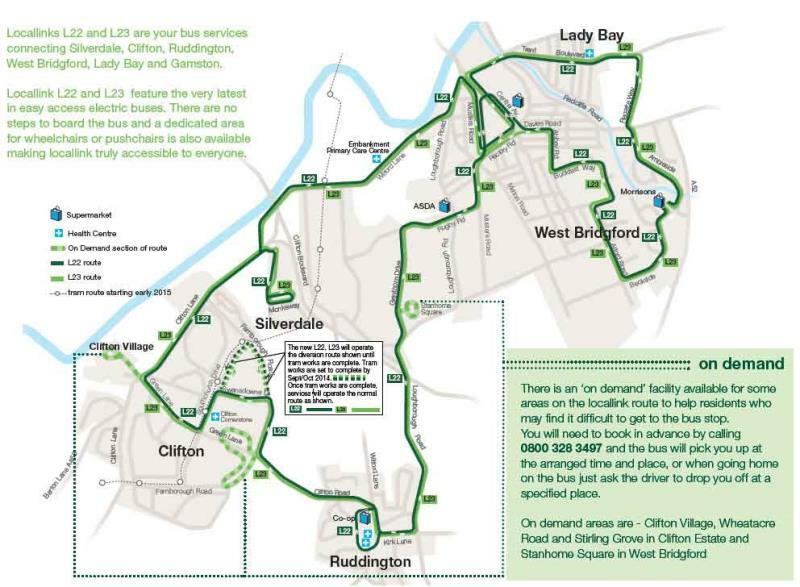 There are two free electric bus services L22 and L23 which run regularly throughout the day connecting Embankment Primary Care Centre with Clifton, Silverdale, Ruddington, West Bridgford, Gamston and Lady Bay. The bus routes are shown above. Dial-a-Ride is a door to door service provided by Nottingham Community Transport for citizens who are temporarily or permanently disabled and are unable to access conventional bus services. How do I register with Dial-a-Ride? Just give our team a call on 0115 969 1801 and they will be able to answer all your questions and help you to register. You can register for Dial-a-Ride if you live within four miles of the City Centre, and you are temporarily or permanently disabled. Membership costs £12 (£10+VAT) and a current fare chart is given to you when you register. A 50% discount on these fares is given if you have a current concessionary bus pass. If you have a helper, they can travel free. How far can I travel with Dial-a-Ride? Dial-a-Ride will take you anywhere within 10 miles of the City Centre, including East Midlands Airport. There is a service 7 days a week from 8.30am to 11.30pm, excluding Bank Holidays. Call 0115 969 1801 for more information. Journeys normally provided by Social Services, Education or the Ambulance Service cannot be made on City Dial-a-Ride. The City Council wants you to use the bus services around Nottingham.